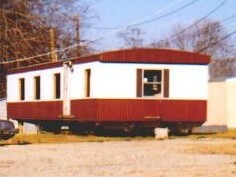 Most of these pictures are taken from "used trailer lots" from all over the state. They seem to be popping up everywhere. This is when somebody buys up a bunch of junk trailers and tries to turn a buck. Quality isn't even an issue here, price is. Starting at $500 and up, what do you expect!? Great starter home! Needs some work. This one is only $500 and has everything you could ask for, except a living room wall. This one is priced for the big spender. If you can choke up $2,500 it's yours. Since it has a couple of windows broken out, I'll bet you could talk 'em down to at least $2,250! A bargain, priced at just $500. Notice, one of the front windows has been replaced with plexiglass. You never have to worry about that one getting broken again! The prices of the trailers on this lot are marked on the windows with shoe polish. 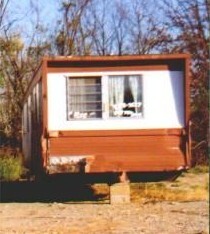 But this trailer doesn't have ANY windows, so I guess you'll have to ask the sales guy. I'll bet it's pretty cheap. Just think, with the money you save, you could buy plenty of plywood. This trailer has its ups and downs. The front isn't too bad, but look closely as you go towards the back, things sort of go downhill... Literally!